Holy crap, it was so good. 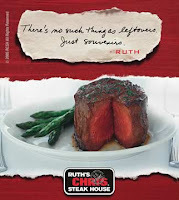 If you’re a carnivore and you like your steak (as I am and I do), you can do no better than a steak at Ruth’s Chris. It was the best meal I’ve had in a long long time, from the iceberg salad to the steak, including the shoestring fries and broccoli, and all the way to the chocolate explosion cake. And of course, the steak was served on a sizzling hot plate, which always reminds me of that great Saturday Night Live skit (or maybe it’s vice versa). Oh man, was this tasty. I cannot wait to go back again. Hopefully I won’t have to wait another year and a half. ← Maybe She Needs to Be Schooled?